I just read about Therapy Dogs for Autistic People. I wanted to get a dog for my sister so she would not be too lonely being by herself. However, I was always worried how the dog and my sister would interact. I am very happy to hear about this program so now I can get a dog for her without worrying about anything. I really want to get a therapy dog for my sister. Unlike other autistic people, my sister is very social. My sister loves to interact with people and have fun with them. However, people normally do not understand my sister’s behavior and talk, so it has been always very difficult for my sister to make friends. I always felt really bad looking my sister staying home alone without any friends. I think this dog can be her best friend and reduce her loneliness. This dog can be someone that my sister can lean on to, talk to and have fun with. I am really glad to hear this news. I hope many autistic people get benefit from this program. Here are the some benefits of getting these dogs. 1. Calming the child: Autistic people have hard time of controlling their emotions and they show wild behaviors often. Based on many observations, therapy dogs can help keep them calmer. They tend to feel less angry and show less aggressive behaviors. 2. Reducing repetitive behaviors: Therapy dogs have trained to recognize the repetitive behaviors and interrupt the autistic people. Also by spending time with the dog, they tend to spend less time for repetitive movements. 3. Increased language skill: They tend to feel more comfortable speaking to the dog than people. Due to this, they improve on their language skills and vocabulary faster. 4. Increased social interactions: By spending time with the dog, they learn how to interact with others. Also they can understand each other emotionally easily than others. So, they normally becomes soul mates in their lives. 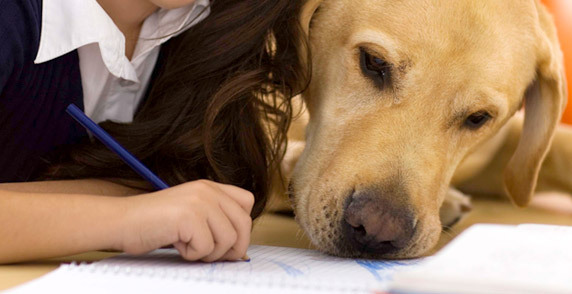 Here are websites that you can get more information about therapy dogs for autistic people.